This celebrates the day that Charles II rode into London on 29th May 1660 (his birthday) and restored the monarchy to England. People celebrated this day with great celebrations and bonfires. 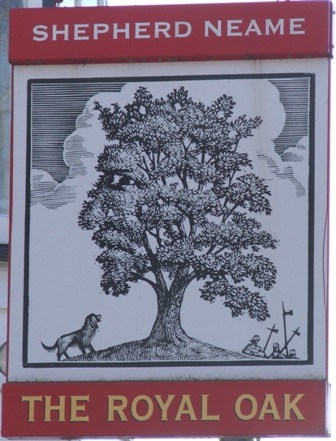 The oak tree became a symbol for the day being the tree that the King hid in after his defeat at the battle of Worcester in September 1651. The day also seems to have been a great excuse to spread the traditional May Day celebrations further into May and in some cases move the traditions to this day completely. Houses and Churches were decorated with oak boughs, maypoles were danced around and sprigs of oak leaves (often with galls otherwise known as oak apples attached) were worn on hats and clothing. Those daring not to wear a sprig of oak were open to being pinched, punched, kicked and even attacked with bunches of nettles! The traditions changed over the years until at one point oak leaves were worn in the mornings and ash leaves in the afternoons and plough horses bridles were decorated with both ash and oak leaves. In the Derbyshire village of Castleton on May 29th a garland is still constructed and placed over the head and body of a man who rides around the town bearing it on horseback. The man is known as the King and is accompanied by his Queen and morris dancers all in white. At the end of the procession the garland is hoisted to the top of the church tower where it stays until the flowers die. The garland may be a forerunner of the later (and now current) tradition of the Jack-in-the-Green.